How vibrant is the entrepreneurial ecosystem in your city? What are the major barriers to its growth? How happy are you with the ecosystem infrastructure? On the occasion of the Hometown Summit, which was hosted in partnership with the Darden School of Business, we asked the invited guests—through a brief survey in advance of the Summit— to assess their cities' entrepreneurial communities. As of April 10, 61 people responded; 35% of them worked in nonprofits, 30% in private companies, and 27% in government agencies. More than two-thirds had experience of founding at least one business or nonprofit. Men and women were equally represented. About one-third of the responses came from only one city: Charlottesville. While this allowed us to have a good look at what Charlottesville’s community leaders think about their city, this sampling bias means we should be careful about drawing general conclusions. Other responses came from 21 other cities, almost all of them on the East Coast or in the Midwest. We found people were mostly happy with the quantity of networking events, university courses/programs, incubators/accelerators, and co-working spaces in their city. This perhaps reflects growing interest from the local governments, universities, community nonprofits, and business services providers in the development of the local entrepreneurial ecosystems infrastructure. The respondents had a generally positive opinion of their city’s public safety, education, restaurant scene, and quality of life – usually rating their city as one of the best or above average in these criteria. Income inequality was an exception. Only five percent thought their city fared better than average in addressing income inequality. People were generally not happy with the amount of financing available to entrepreneurs. Three in four respondents thought that not having enough regional investors was a barrier to growing a vibrant entrepreneurial ecosystem in their cities. Real estate cost was considered a barrier by two in three respondents. Close to half the respondents thought the lack of proper broadband infrastructure is a barrier. A similar number considered low talent availability to be a barrier. About 40% thought that not having enough willing entrepreneurs was a barrier, while 45% thought it was not. Less than one in three respondents thought that regulations on small businesses were a barrier. 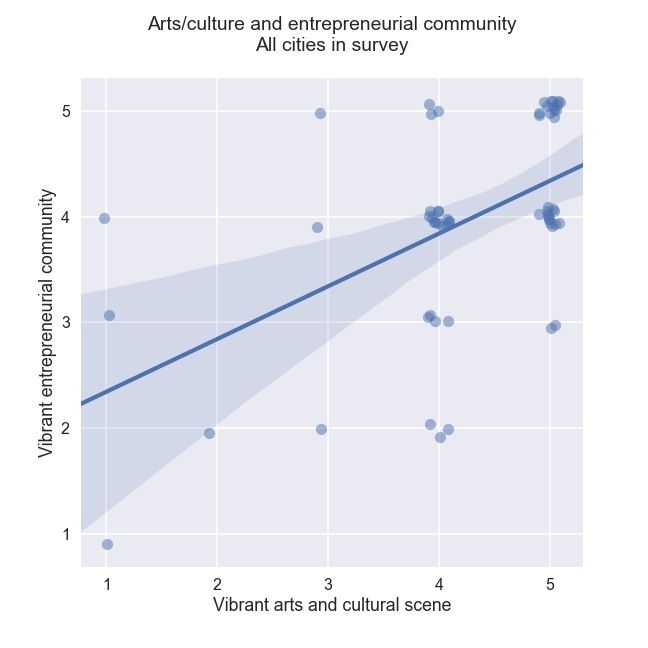 People who rated their entrepreneurial communities highly, in general favorably rated the local arts and cultural scene too. 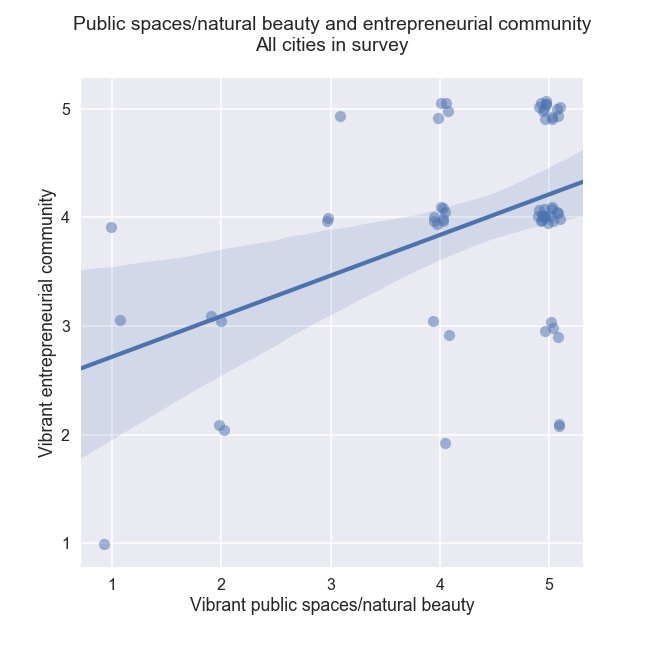 We found a similar correlation between the vibrancy of entrepreneurial communities and availability of public spaces and natural beauty. Despite the complaints, three-quarters of the respondents said that they were happy with the vibrancy of their entrepreneurial ecosystems. And, almost everyone expressed optimism that their city would become more vibrant in the next five years.